Things aren’t as bad as they were when futures first opened Sunday evening, and US equities are now looking to kick off the week on a modestly positive note this morning. After the S&P 500 and Nasdaq just had their worst week in over six months while the Russell 2000 had its biggest decline since January 2016, one could say that we were at least due for some gains. Keep in mind too that all that weakness last week came in the span of just four days too! Global equities are mostly in the red as Asian markets traded down over 1%, and European markets are down just modestly as they, like US futures are off their lows. Treasuries are selling off slightly this morning as the 10y3m curve steepens slightly but remains at an exceptionally flat level of less than 50 bps. Meanwhile, crude oil saw a quick 1.5% sell-off at right around 4:30 New York time which was blamed on continued worries that the US/China trade war will sap demand. We’ve discussed numerous times how many international equity benchmarks are already in their own bear markets, but because the US has held up considerably better than global peers and its overall weighting in the global equity pie is so large, it has been able to keep global equities as a whole outside of bear market territory…for now. This morning, global equities are moving one step closer to bear status as the Bloomberg World equity index appears to be breaking below support. 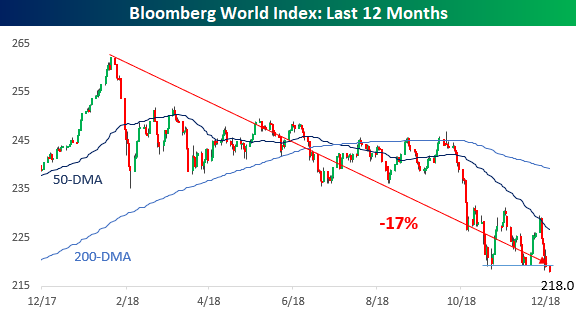 The index is now down 17% from its highs earlier in the year, so a few more days like we saw last week, and global equities will have lost one-fifth of their total market value.